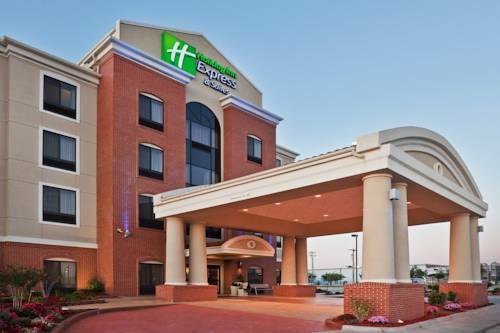 The newest hotel addition to San Antonio, the Holiday Inn Express and Suites San Antonio SE by ATT Center is conveniently located on the East side of San Antonio on Loop 410, South of I10. With a rich and colorful history, San Antonio has established itself as one of the top leisure and business locations with Holt CAT, HEB, Dr Pepper-7-Up-Big Red and the Oil and Gas Companies working on the Eagle Ford Shale. San Antonio captures the Spirit of Texas. Some of the attractions include The Alamo, San Antonio Riverwalk, Fiesta Texas, SeaWorld of Texas and San Antonio Zoo. There are also places like the Wonder World Cave and Park, Schlitterbahn Water Park, Splashtown, and Natural Bridge Caverns that warrant a visit. There is plenty of local dining throughout the city that you can not miss. Relax in your elegant room featuring stylish d cor and amenities, including free wireless high-speed internet access, executive desk, 37 inch flat panel TVs, and the best nights sleep youve had in weeks. Start your day off on the right note with our HOT Express Start Breakfast Buffet. Enjoy a swim in our crystal-clear outdoor pool or energize in our Fitness Center. Polish that presentation in the business center. We even have 1060 sq ft meeting room for your professional meeting. The Holiday Inn Express and Suites San Antonio SE by ATT Center is ready with all you need to make your trip a success. The World Famous San Antonio Riverwalk is one of the top destinations in the United States. With nationally known and renowned restuarants, entertainment and shopping, everyone can find something to do and see. Six Flags Fiesta Texas is a 200-acre theme park featuring awesome rides, great shows, and incredible attractions, plus The White Water Bay waterpark. Days and Time of Operation vary seasonally. The 35-acre San Antonio Zoo has a collection of over 3,500 animals representing 750 species. The zoo's annual attendance exceeds 1,000,000. Days and Time of Operation vary seasonally.